NO RESERVE - This is a copy of Marvel Super-heroes # 20 - featuring Dr. Doom - CGC 9.6. This issue is from Marvel Comics; cover dated May 1969. You will look long and far before you run across another copy of this book for sale in this high of a grade. Silver Surfer # 5 CGC 9.6 Off-White to White (Marvel, 1969) Fantastic Four appearance. This Bronze Age gem features an appearance by theFantastic Four. Certified Copper Age Comics. Certified Bronze Age Comics. I ALSO HAVE MANY UNSLABBED MID TO HIGH GRADE SILVER AND BRONZE AGE COMICS INCLUDING ACTION, DETECTIVE, SPIDER-MAN, BATMAN, THOR, HULK, FLASH, IRON FIST, STRANGE TALES, SUPERMAN, DR. STRANGE, CAPTAIN MARVEL AND MANY MORE. New Mutants #87 CGC 9.6(SS) Liefeld W/P'1st App..Cable.! 1st. Print! Rare Sig! .New Muties.Cable.Stryfe. Publisher: MARVEL. Artist: Liefeld/McFarlane. 2nd Appearnce of the Black Panther !! Silver Surfer and Sandman Appearance! Signed by STAN LEE! Item is much nicer than the pictures above. FANTASTIC FOUR #54 CGC NM+ 9.6; OW-W; Inhumans & Black Panther app! FANTASTIC FOUR #73. GRADE: NEAR MINT (9.6). Item As Described! Nice To See Accuracy For Non CGC Graded Books! ". " Excellent grading, as a pro I agreed with you on all comics ". Certification #0916960011. CGC 9.6 Universal. Fantastic Four #92, 11/1969. 1965, NEAR PERFECT OFF WHITE TO WHITE PAGES ! Liefeld/McFarlane, Etal COVER & ART! Artist: Liefeld/McFarlane, Etal.New Muties.VULTURE.! New Mutants #85 CGC 9.6 W/P ' App. Certification #1043393005. CGC 9.6 Universal. Fantastic Four #69, 12/1967. Front and back pictures are of the item you will receive. FANTASTIC FOUR #47 CBCS NM+ 9.6; White pg! ; Kirby cvr/art; Inhumans app.! 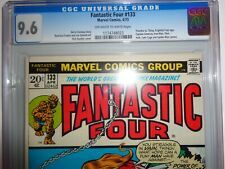 FANTASTIC FOUR #47 CBCS NM 9.6; White pg! ; Kirby cvr/art; Inhumans app. FANTASTIC FOUR #68 CBCS NM+ 9.6; White Pg! ; Kirby cover/art; Mad Thinker app! FANTASTIC FOUR #68 CBCS NM 9.6; White Pg! ; Kirby cover/art; Mad Thinker app! SIGNED by Both Stan "the Man" Lee, Mr. Marvel Comics himself plus legendary artist Joe Sinnott who was the cover artist for this issue. JOE SINNOTT, who worked over 60 years for Stan Lee, started as a comic inker & worked his way to becoming a cover artist legend in his own right. Certification #1109165003. CGC 9.6 Universal. Fantastic Four #71, 2/1968. In other words. Why buy from Derrick's Comics & Collectibles?. White pages. We are talking about standard issue genres we all love from the 60's 70's 80's 90's and beyond. we have it all and the a little more. Marvel Comics Group TALES TO ASTONISH - Sub-Mariner #5 - 1980 - MINT! Found in the ATTIC! This is exceptionally well preserved, in plastic on whiteboard. In other words. collectibles on the planet. Why buy from Derrick's Comics & Collectibles?. We are talking about standard issue genres we all love from the 60's 70's 80's 90's and beyond. What will you find here?. I am not a professional grader, but I am an avid collector and believe I have developed an eye for books. I will bend over backwards to make this sale worth your while. All picture are high definition images of the actual book you will be receiving. Comic, Shazam! Comic Book, Shazam! Comics, Shazam! Marvel Tales #250, CGC 9.6 Marvel Comics, 6/91 SPIDER MAN & FANTASTIC FOUR GRADED COMIC BOOK . 1 GRADED CGC COMIC. CGC CERTIFICATION. BIGGEST AND BEST COMIC BOOK FIND! Grade 9.6 NM . Our triple booth space was dominated by a rich blue velvet rear back board that was always covered with high-end key issues! We don't want you out a penny for a book you are not thrilled with. Autographed material: all genres. accurate grading. Just very slight professional color-touch, no trimming. Accurate grading. Very slight professional color-touch, slight trim. Rate by location. accurate grading. Slight professional color-touch, 1 tiny chip repair, and a very slight trim.